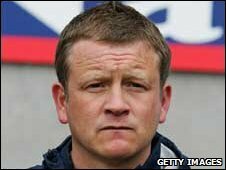 Blue Square Premier side Oxford United have appointed former Halifax Town boss Chris Wilder as their new manager. Wilder, 41, leaves his job as assistant manager of League Two side Bury, where he had worked under manager Alan Knill. He succeeds Darren Patterson, who was sacked by Oxford last month. Director Jim Smith had been in charge on a caretaker basis, and was unbeaten. The appointment comes after a extensive search by the U's who interviewed a number of potential candidates. What do you make of Oxford's appointment of Chris Wilder? Wilder had spent six years in charge at Halifax, but left the club in June after they were demoted three divisions from the Blue Square Premier to Unibond Division One North after a long struggle with financial problems. Smith's final game in temporary charge was Saturday's 1-1 draw with Stevenage at the Kassam Stadium, which left the U's in 13th place in the Blue Square Premier - 11 points behind the play-off places - going into the festive fixture programme. Wilder, meanwhile, had been with Bury for the final time as they lost 2-0 at Bournemouth.